Email marketers are often faced with challenging situations, such as having a low reputation in their emails. You don’t want that to happen to you, having a low reputation means your emails won’t get through or worse, you’d get blocked. This happens when bounce rate in emails are higher than what is required. Sending invalid emails can ruin you and your company. Need a reliable email verification service that delivers? BriteVerify is the service for you. How do you establish a good reputation when you are in email marketing? The answer is quite simple. Before sending out your emails, you need to have your email addresses checked, verified and validated. BriteVerify has been doing exactly that for a while and has established themselves when it comes to reducing bounce rates in emails. They can help your emails get delivered to the right recipients while reducing your bounce rate up to 98%! Isn’t that good news? With BriteVerify you can easily turn future prospects into customers with just a click of a button. Have a list of emails? Verifying them is easy! You can just drag and drop the list into the designated window or import them from your Cloud storage or email. BriteVerify will scan the list and show you the needed records. You can share this information or save it on your storage for later. With their “real-time” email verification system, it will make sending emails easier and more efficient. BriteVerify will keep those invalid emails out of your database. This will result in better conversion rates with less errors. To do this just integrate the BriteVerify API into your webforms, applications, POS or CRM to apply the validation and verification process. This makes sure that the emails entered are all valid, chances of having an error are very slim to none. Thanks! 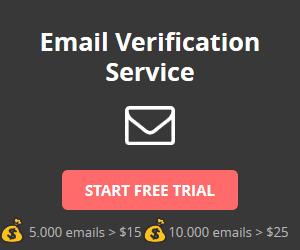 I’m using another email verification service with it is very good https://www.zerobounce.net/, if you want to keep your database clean by improving your email list hygiene and protect your emailing reputation and deliverability try this service! They offer also 100 credits free for a test.